Fast response, self-diagnostic and on-line testing. 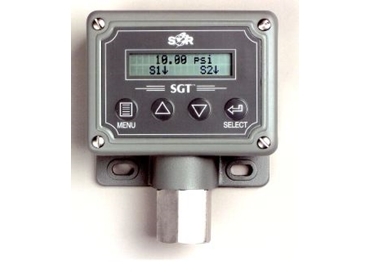 THE SGT electronic pressure instrument from SOR (Static-O-Ring) is now offered in absolute pressure ranges. Available from Flotech Controls , this innovative, multi-functional field instrument provides two relays, local indication and a 4-20mA analog output approved for use in Class 1, Div 2 hazardous locations. Fast response, self-diagnostics, on-line testing and password protection make the SGT the first field device of its kind designed with ANSI/ISA-S84.01 performance requirements in mind. The SGT combines the multiple functions of a dual switch, a gauge and a transmitter in a compact, loop powered device. Each switch open/close value (deadband) is independently configurable and are unaffected by the scaling of the analog output. The gauge, with user configurable engineering units, continuously indicates the process variable up to 150 per cent URL. The configurable zero and span of the transmitter allows for 5:1 turndown of the analog signal. Absolute pressure ranges from 10 to 2,000psia have been added to the product offering. The device is also available in ranges from 30" Hg vacuum to 2,000 psig. The SGT is UL and cUL approved, ATEX certified and backed by a three-year warranty.